Introduction: cardiovascular risk factors appear early in childhood and adolescence. The main ones are: arterial hypertension, obesity, inadequate diet, sedentary lifestyle, alcoholism and smoking. 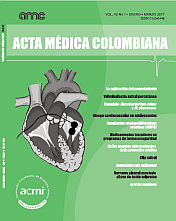 Objective: to determine the prevalence of cardiovascular risk factors in adolescents of the National School of Diversified Middle Education of Itá (Paraguay) who attended clinical control in March and April 2.015. Methodology: observational, descriptive, prospective, cross-sectional study that included 132 adolescents of both sexes. Results: prevalences were: systolic arterial hypertension 1.5%, overweight 8.3%, obesity 2.7%, sedentary lifestyle 58.3%, smoking 6.8% and occasional alcohol consumption 47.7%. Overweight and obesity did not show a statistically significant relationship with high blood pressure.